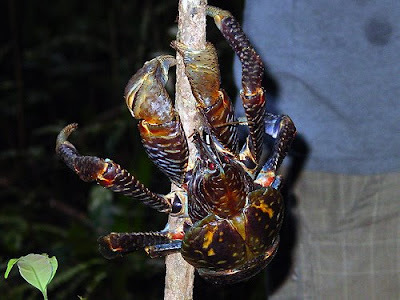 A few facts about the coconut crab (a species that I feel too few people know about) followed by a few pictures of said species. Unlike that Mae West post, these are completely for real. 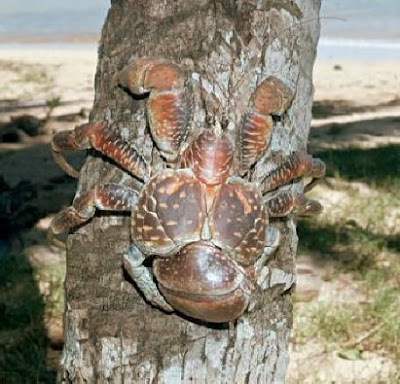 The coconut crab is the largest living arthropod, a biological phylum that includes insects and arachnids in addition to crustaceans. Its leg span can reach 6.5 feet across. On one occasion, the coconut crab was observed to eat a rat. 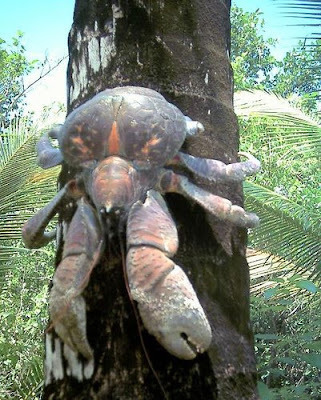 And with this in mind, observe these photos of the coconut crab in action. You're most likely to run into one of these monsters on Christmas Island than anywhere else, but report back with nightmares nonetheless. Uh-oh, this blog has crabs. Dateline, Andaman Islands, India: Was Mae West just a coco crab in a platinum blonde wig? Details to follow. I think its main food group is souls. Ai ya. It looks like an giant, evil rolly-polly. Though we tied one up outside (ready to eat the next day) and it escaped and climbed up the netting outside our bedroom. IT WAS TRYInG TO GET US. I was so bloody scared of these, even when all trussed up. Their claws are ridiculously strong.